Hello everyone! I’m back in Philadelphia with my family, basking in the afterglow one experiences after months of travel, sharing photos and telling stories of my recent adventures in Panama. One of the most memorable trips this past season was a 4-day/3-night sea kayaking and snorkeling trip to Coiba National Park, located on the Pacific. It is one of my favorite places to explore in Panama. I’ve traveled pretty extensively throughout the country and Coiba is a place that I return to every season. Each visit I discover something new and wonderful. It is a bio-diverse paradise, brimming with life and opportunities for adventure. 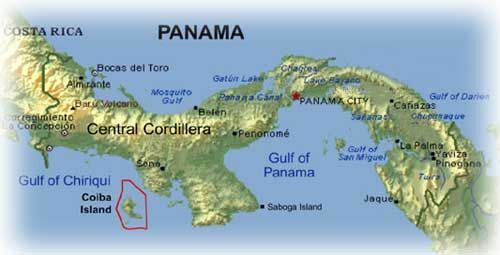 A must-see if you travel to Panama! A sea kayaking and snorkeling tour is highly recommended, as it is surrounded by one of the largest coral reefs on Americas’ Pacific coast. Plus, it’s pretty cool to say you’ve been to the largest island in Central America (194 sq miles), and the biggest uninhabited island on the whole Pacific coast! Coiba is worthy of quite the accolades. Located in the Gulf of Chiriquí, Coiba National Park is a marine reserve comprised of 38 islands, including the largest, Isla Coiba, where our kayak and snorkel trip took place. It is actually part of the same underground Coco Ridge mountain chain as the Galápagos Islands. Isla Coiba was established as an offshore penal colony in 1919, under the dictatorships of Omar Torrijos and Manuel Noriega. It housed more than 3,000 political prisoners, known as “Los Desaparecidos” (Missing Persons). It was said that being sent to Coiba was like a death sentence. The last convict was released from the prison in 2005, the same year it was declared a UNESCO World Heritage Site. To give you an idea of the biodiversity that awaits you, Coiba is home to 147 bird species, 760 species of fish, 33 shark species (including the Whale Shark), and 20 species of whales and dolphins, as well as many endangered and vulnerable species (Loggerhead, Leatherback, Hawksbill and Olive Ridley turtles, Tiger Sharks and Crested Eagles). Because it remained untouched and undeveloped for so long endemic species evolved on the island, including the Coiba Island Howler Monkey, the Coiba Island Agouti, and 21 species and subspecies of birds. In fact, Coiba is the only area in Panama where the Scarlet Macaw is found in significant numbers. Check out this lovely article with gorgeous photos of some of the flora and fauna on Coiba, as well as conservation information. Coiba is worth protecting. Check it out! The snorkeling on Coiba is absolutely amazing! My good friend who guides there says it’s like snorkeling in an aquarium, as there is an incredible amount of life to discover under the water (rays, reef sharks, turtles, tropical fish of all colors, sea stars). We were as happy as clams to spend hours each day hopping out of our boats to snorkel. We also took full advantage of the fact that we were guides on vacation and enjoyed lots of relaxation. . . lounging around on white sandy beaches, lounging around in hammocks, lounging around in the tent. . . you get the idea. Actually, I spent more time in the hammock while Kira worked to open coconuts with her bare hands. She was so determined. Good thing she had Nemesio to teach her the ways. This video is pretty hilarious. Sea kayaking here is spectacular! Contact me if you’re interested in a trip to Coiba. There are lots of options for different types of paddling, and one can often choose a more (or less) conservative path. There are calm and protected bays, beautiful mangroves to explore, lots of small islands to circumnavigate, secluded beaches, and fun areas with rock gardens and swell for the more experienced paddlers. And it’s just so easy to hop out of your boat and snorkel! I hope that you have enjoyed this virtual trip to Coiba National Park, and that it has inspired you to visit this gem of a place in the beautiful country of Panama. Until next time, happy and safe adventuring. Thanks for reading! I leave you in the same way that we left Coiba Island, with dolphins leaping joyously out of the water to our delight. Chao!